The joy and warmth brought by family, whether it’s preparing delicious home cooked food, sharing gifts with little ones or, as Li says, simply standing face-to-face with the ones you love, is why we put up with these difficult journeys through the festive period. Travelling home for the holidays is one of the most stressful, demanding and draining times of the year, when patience and nerves are tested to the limits. Irritating passengers who insist on bringing their entire wardrobe as hand luggage, leaving you with no personal space, and inconsiderate travellers who play their terrible music without headphones, leave you feeling tense and on edge. Those who travel in the safety of their own cars also can’t escape the madness, with the agony of sitting in long traffic-jams for hours only beaten by the mood swings of their own children, who switch painstakingly between euphoric singing of Disney classics to incandescent screaming, as their brother or sister has moved a millimetre onto ‘their side of the seat’. It is enough to make you want to turn around, tell your family you’ve got to work and enjoy a stay-cation for the rest of the holiday. 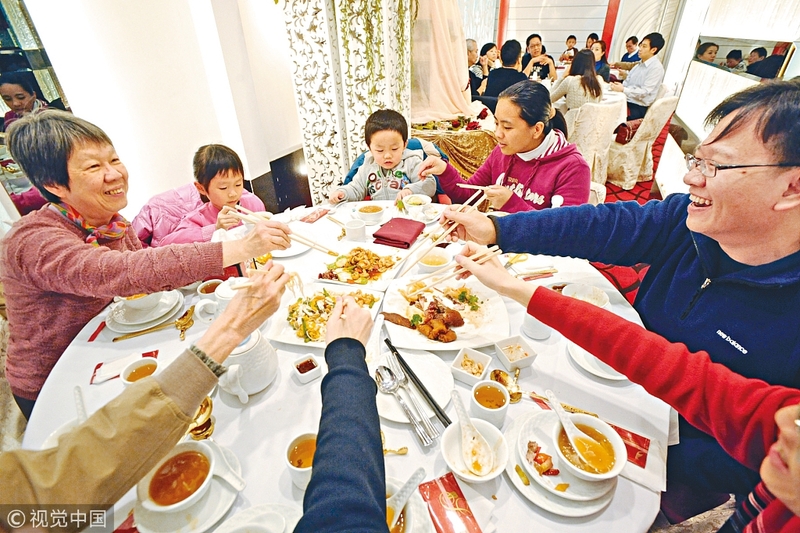 Currently in China many people are enduring these experiences, as travellers return home for their most important holiday, Spring Festival—also referred to as Chinese New Year. 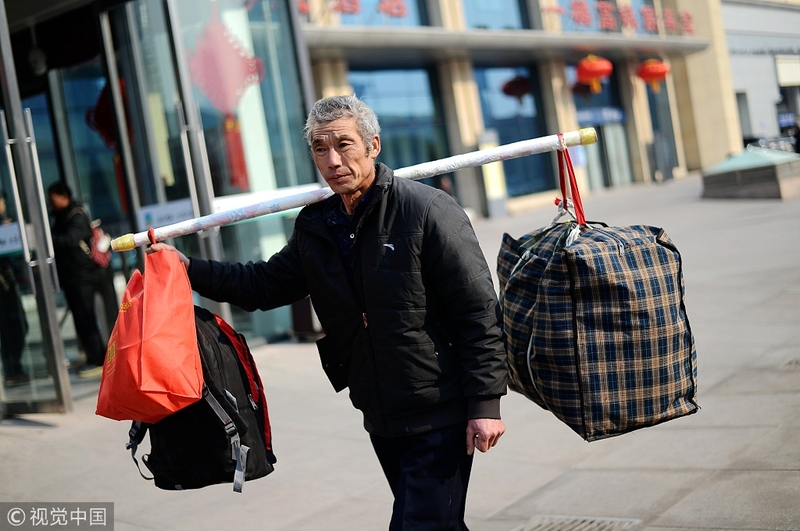 This seasonal travel rush, known as Chunyun, sees people leave their busy lives and return to their parental homes, with some travelling the width and breadth of the country in what is the largest annual human migration in the world. According to Lian Weiliang, deputy head of the National Development and Reform Commission, nearly 3 billion trips are expected to be made this New Year, with highways (2.46 billion trips, down 0.8% over last year)，rivers (43 million, unchanged) and airports (73 million trips, up 12%), expecting the busiest activity of the year. 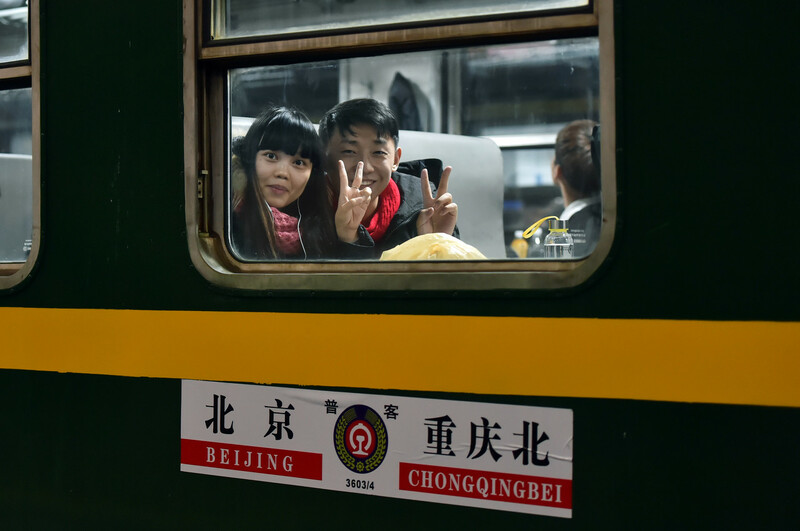 Train travel however still remains one of the most popular forms of transport during the holiday, with around 413 million journeys (up 8.3%) expected during Chunyun, according to the commission. These journeys will be made on the world’s largest and most sophisticated train network, where passengers are able to choose between the super-fast and super-efficient high-speed rail, or the more traditional electric trains. Since 2007, China has developed the world’s largest high-speed rail network that stretches the four corners of China. 29,000 kilometres of high-speed rail track— two thirds of the world’s current high-speed rail network, is now available to Chinese travellers, according to the China Railway Corporation (CRC). Over the past decade, trains along the network have become longer, faster and more efficient but none more so than The Fuxing, China’s new, self-developed model. Launched during this year’s Spring Festival travel rush, the new high-speed train is 17 carriages long and able to carry 1,283 passengers at a speed of 350 kilometres per hour. 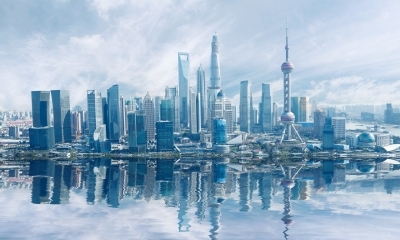 The Beijing to Shanghai route, which uses these new Fuxing trains, transports passengers along the 1318-kilometre route in more comfort and style, delivering passengers to their destination in only 4 hours and 28 minutes, an hour earlier than before. 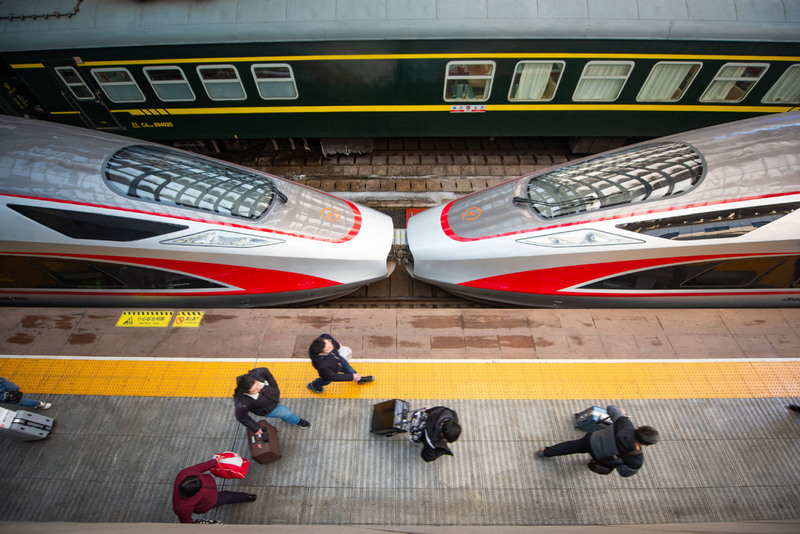 The speed and comfort of China’s high-speed trains means tickets during the travel rush are snapped up quickly. Remaining travellers are then left with the choice of either buying over-inflated plane tickets or taking one of China’s other trains. The Manche, or “slow” train, is a locomotive similar in style to British or American trains. These offer a cheaper route back home and whilst they don’t provide the same blistering speed like the Fuxing, they have greatly improved. One person who has witnessed this improvement is train attendant Sun Mingjin, who this year is working his 39th Spring Festival. When he started, coal-powered steam engines would puff great white clouds out of the train’s chimney, as they transported people home for the holidays. 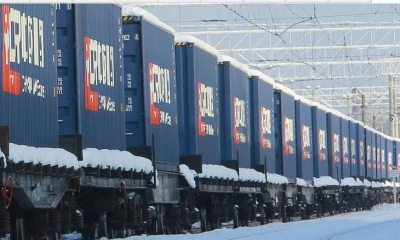 Cold weather would prove troublesome as the inadequate carriages failed to keep passengers warm with the low temperatures, which can reach -20℃ in some northern cities, causing havoc. Those freezing, over-crowded trains have now been consigned to the scrap heap, with diesel and electricity replacing the old coal engines. Current trains now hurtle along the tracks at speeds of 160 kilometres per hour, making a mockery of their “slow” nickname. Sun speaks glowingly of these advances, which have helped improve conditions inside and outside of the train Speaking before his retirement next year, Sun says the current locomotives are “quiet and more environmentally friendly”, which is good for everyone. Travel by train during Spring Festival is still more popular than flying, and not just because of the price. It offers a simpler and more social travel experience, reminiscent of a by-gone-age of the great explorers. That is the view of twenty-nine-year-old Li Gang, who this Spring Festival will make the 2,468-mile round-trip back to his hometown, reuniting with family, some of whom he hasn’t seen in a year. Taking a slow train twenty-one hours back home when there are other, quicker alternatives may seem a strange choice, but for Li, it is no problem. “I generally choose a hard seat [on the slow train]. The hard seat isn’t comfortable but it is convenient and with the other passengers, I can chat. Without question, his journey from Beijing to Jiuquan, Gansu province, will allow him to take in some of China’s most breath-taking scenery, as he travels across the country from east to west, passing luscious grasslands, golden desserts and snow-topped mountains. With just a few days at home before he returns to Beijing, it’s hard to believe someone would spend so much time travelling for such a short trip. But as Li explains, the lure of family is too strong to turn down. “From my personal experience, I think the whole year, I’m away working and I have a very small amount of time to speak with my family face to face, a small amount of time to look after them. While we may hate listening to other people’s music, feeling cramped on a tight train or listening to our children blurt out “Let It Go”, Li’s journey epitomises the strong pull of family, which is such a crucial part of Chinese New Year celebrations. 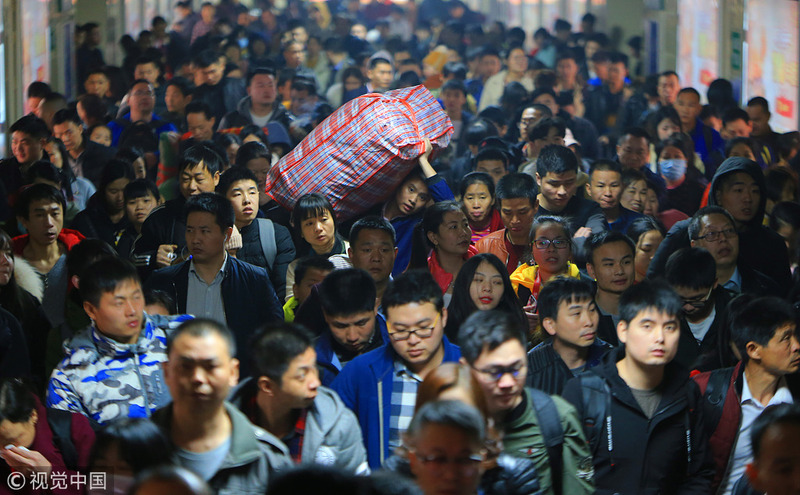 At least in China, thanks to the advances in technology and the improvements to infrastructure, train travellers can return home faster, a lot more comfortably and considerably safer this Spring Festival. 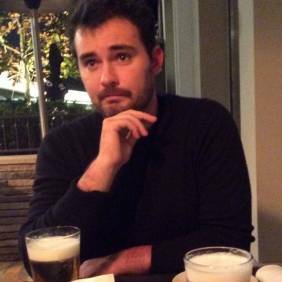 Thomas Scott-Bell is an editorial writer for China Focus. 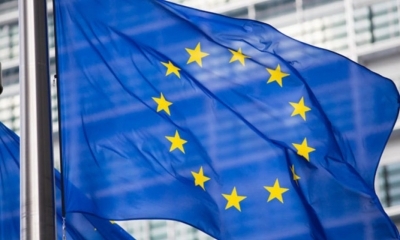 Are China and the EU Partners, Competitors or Rivals? 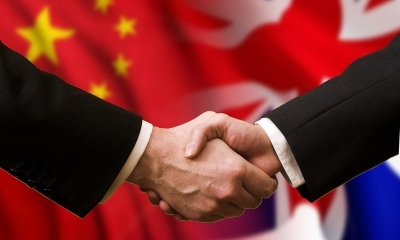 Is China Passing a Law Only to End the Trade Dispute?